Kadiri Adjaratou joined the Alaffia Shea Butter Cooperative two years ago. She was one of nine new members that we recruited due to the success of our EveryDay Shea line last year. Before joining Alaffia, Kadiri helped her elderly mother sell charcoal and fire wood at local markets. 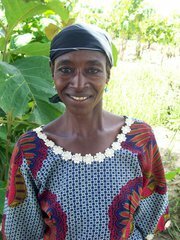 She also worked alongside her husband in their family farm near the village of Talamouanadè. Two months after joining the Alaffia Cooperative, Kadiri saw a big difference in how she was able to provide for her family. Her steady salary has enabled her to abandon charcoal production, and she no longer spends long, hard days searching and cutting firewood to sell. Thank you Kadiri for all that you have done for Alaffia! We hope you continue to thrive! Notwithstanding encouraging school, I've had understudies grumble to me about individuals from the gathering who weren't pulling their weight. do my college homework. It is the experience of some skilled children that most individuals from most gatherings aren't pulling their weight. This sort of conduct isn't typically endured in the work environment, however it's exceptionally normal in school.